Reviewing the visualization exercise from Alberto Cairo and Randy Olson’s breakout session. 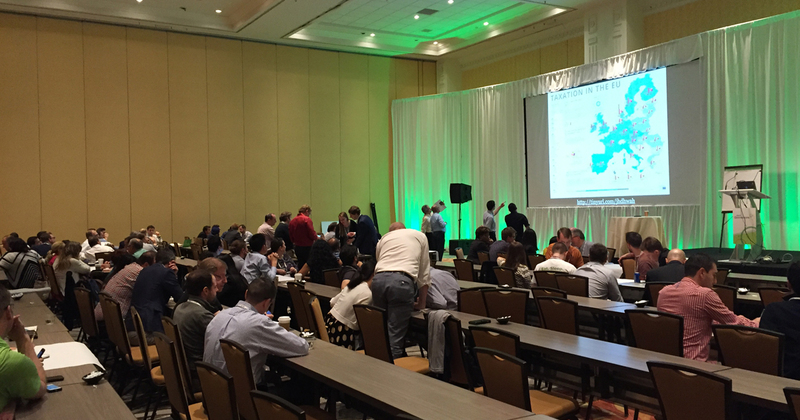 In the process of setting up breakout sessions for Qonnections, Alberto Cairo and Randy Olson wanted to do something unique, fun and educational for attendees. 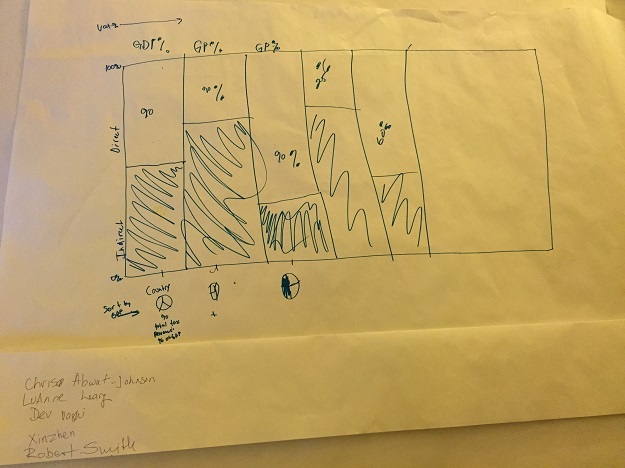 Right off the bat, each team had to make a decision on what data they wanted to pull out from the original graphic and then determine how best to represent that data visually. It was clear that each group’s conversations about how to best represent the data went in many different directions. This chart in particular by Chris Abwat-Johnson, LuAnne Leary, Dev Vaghi, Xinzhen and Robert Smith shows a far simpler way to display the data. It shows the percent of taxes both direct and indirect and sorts the countries by percentage that they collect taxes. By focusing on a smaller sample of the data, this group is able to chart percentage trends that may have escaped readers of the previous graphic. 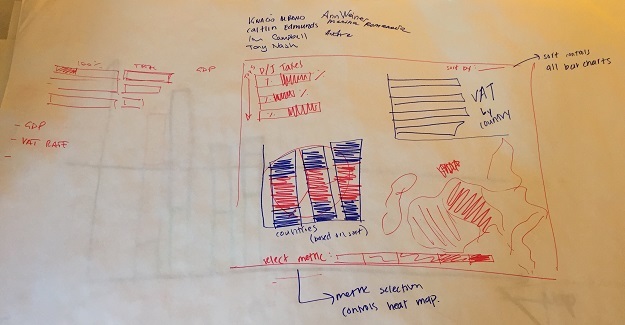 How would you redraw an out of whack #dataviz? #Qonnections attendees gave it a try! 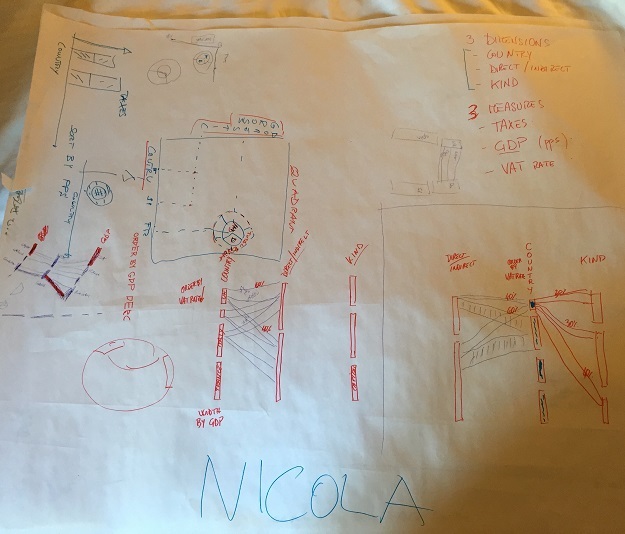 Speaking of unusual graphics, here is a great example from Nicola who tried to use a waterfall chart, similar to a parallel coordinate chart. This type of chart may be extremely useful to reveal multiple connections between the variables in the data set. Both Alberto and Randy were impressed by this outside the box thinking. From outside the box, we go to an example that is very literally inside the box. 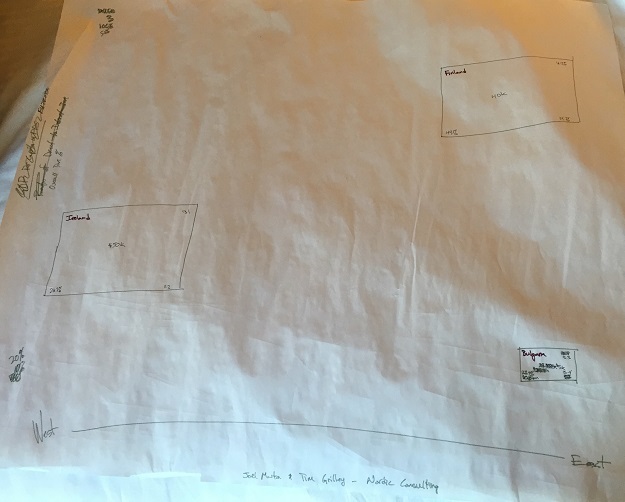 This data viz, created by Joel Martin and Tim Grilley of Nordic Consulting sparked the most intrigue by both Alberto and Randy. There seems to be is a fact box for each country and the box is proportionally scaled but we aren’t sure to what. In the left corner is a percentage, the bottom right corner is a ranking number and in the upper right is another percentage. 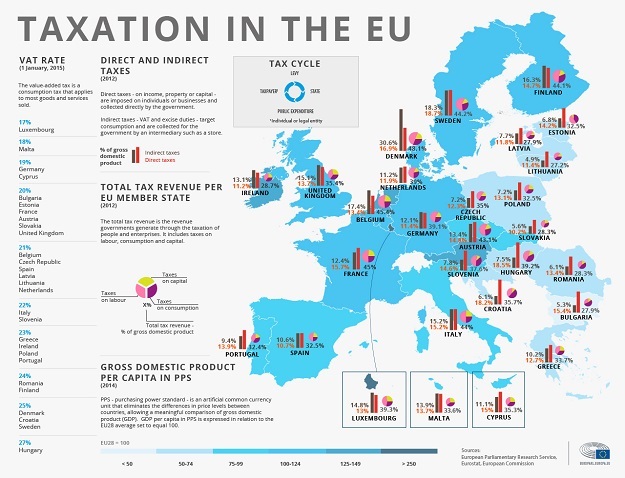 The X axis compares western countries to eastern countries and the Y axis represents overall taxation. Ultimately, Joel and Tim tried something new and different and found a unique way to tell one of the stories hidden within the original graphic. Sometimes, there are multiple stories to tell, as illustrated by the chart created here by Ignacio Albano, Caitlin Edmunds, Ian Campbell, Tony Nash, Ann Weiner, Marina Romanova and Andre. This group was one of the only ones to propose sorting controls in the redraw and that caught Randy’s attention.